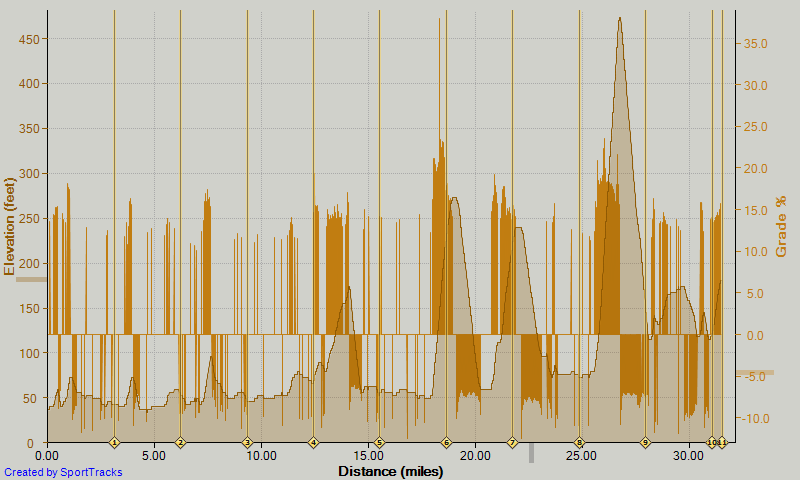 At last – A PROPER FTP Test. This time, I’d got all the Ducks in a Row. I’ve got the Tacx Bushido indoor trainer coupled with a laptop running their TTS Software, and a specific FTP Test Protocol routine to provide the resistance, timing and display facilities. I’ve got the Stages Powermeter – a proper, strain based powermeter system, which measures the ACTUAL force through the pedals, not some “computer derived” formula based on the electrical current generated by the Bushido’s resistance unit. And I’ve got the Garmin 800 to record the Heart Rate, Wheel Rotations, Cadence and power Data. All the same stuff as I’d have if I were riding on the road. 20 minutes of gentle spinning, 0% incline – beginning in the middle range cogs at the rear and the small ring at the front – every 2 minutes, drop to the next harder gear to pedal, maintaining a steady 80-90rpm cadence. At the end of this, you should be in the middle gear on the back and the large chainring. 5 minutes hard “Pin it and Hold It” – +1.2% incline, go as hard as you can, sprinting for the end of the line at 5 minutes. 10 minutes easy spinning to clear lactate from last stage, 0.3% decline, 80 rpm, adjust gears as needed, trying to raise gearing back to final gearing from stage 1 by the end of the 10 minutes. 20 minutes of going as fast as you possibly can, 0.3% incline, try and keep power as stable as possible – don’t stop and start or ride in surges – just keep your HR a couple of beats below it’s maximum, and keep asking yourself “Can I Keep this up to the end” – if the answer is yes, go faster, if the answer is no, slow down a little, and if the answer is “maybe” you’re going hard enough. Try and “sprint for the line” at the end of the 20 minutes again. 10 minutes easy spinning – try and ease your legs back into some form where they’ll actually do what you tell them to. stop, get off the bike, dry yourself off, save the files on the computer and swallow your pre-prepared recovery drink. Hopefully it’ll disguise the taste of blood at the back of your mouth and stop you being completely useless the following day. Don’t worry, the dull headache usually recedes after a couple of hours. So… what did I learn from this test. 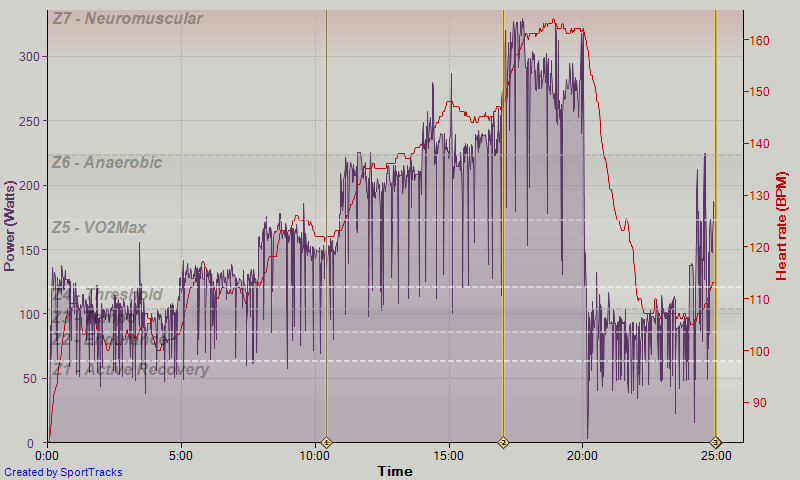 Well – after importing the ride into GoldenCheetah (it’s cheaper than WKO+ and I’m a tight Yorkshireman) and finding the best intervals for 3 minutes and 20 minute power, I plugged them into the Critical Power estimator to calculate my FTP – in this case 259 Watts. Basically, now I’ve got a reliable FTP figure, that’s measured using exactly the same kit as I’ll have on the road, all the road rides can be directly compared to this test, I can set my training zones accurately, so when I’m supposed to be doing a recovery ride, I’m definitely recovering, and when I’m supposed to be working on Tempo, or Threshold, i’m DEFINITELY working at those zones as well.